Tonify kidney yang and augment jing, tonify the lung, stop bleeding, dissolve phlegm and kidney stones are some of the imbalances satisfied clients have used this product for. Chronic cough due to Kidney and Lung qi deficiencies resulting in manifesting or feeble cough and weakness. Cordyceps is the King of Himalayan herbs. Buddhists that live in Tibet consider wild Cordyceps a vegetable because the entire silkworm is consumed by the mushroom. Testing in a lab proves this to be true. Cultivated Cordyceps grown on silkworms has been lab tested and has the same constituents as wild Cordyceps. Cultivated Cordyceps grown on brown rice is only missing the Shen qualities the wild Cordyceps and cultivated on silkworm Cordyceps possess. Cordyceps is a Kidney Yin and Yang supertonic herb. It is the ultimate level of a Jing tonic that builds power and stores energy as well as Qi tonic on the same level as Ginseng. 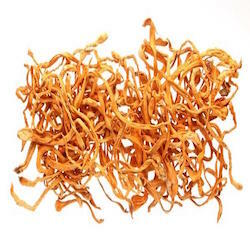 Cordyceps is also a wonderful Lung tonic that protects the immune system and a great sexual tonic. It is good for children since it has no hormone side effects. Side effects associated with the use of Dong Ching Xia Cao include headache, irritability, restlessness, edema and swelling of the face and extremities, epistaxis, decreased volume of urine, yellow, greasy tongue coat, and thready, rapid pulse. Whew what fabulous Cordyceps! Best Ever! You weren't kidding! When I take this by itself I can feel the Jing going from my head to my toes! I have been purchasing herbal supplements and more for many years and your follow up and service has been second to none. Bless you!